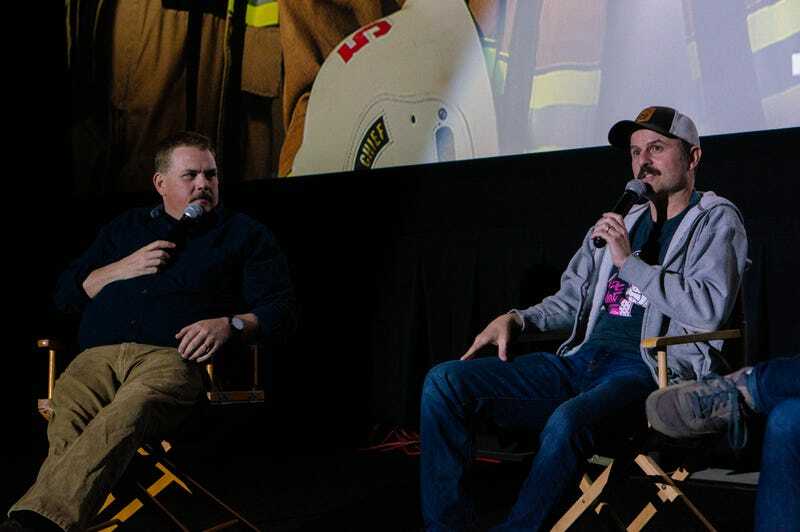 Steve Lemme and Kevin Heffernan — two of the founding members of the comedy troupe Broken Lizard and creators of Super Troopers, Club Dread, Beerfest, and more — are currently on the road screening their latest creation, the upcoming truTV series Tacoma FD. The new comedy series, their first foray into television, focuses on a group of firefighters in Tacoma, WA, the wettest city in America. Without many fires to put out due to constant rain, the crew finds other ways to entertain themselves. I flew to Denver to catch the first screening of a few episodes of the series, and to sit down and chat with Heffernan and Lemme about the show. When I met them before the screening, Heffernan and Lemme’s gregarious nature immediately shone through. They had no preciousness about their time or their green room. After a big, hearty handshake and plenty of questions about the pronunciation of my first name (it’s Jock-o, not Gee-ack-oh), the duo invited me to chat. The first order of business was to put in an order of beers and fried pickle chips. Once that was settled, we talked about the creation of Tacoma FD. “And then the real question,” Lemme explained, “when we got the green light on the pilot: do we keep the mustaches?” The two still sported their fireman mustaches, and it was a jarring sight to see these usually uniformed guys all mustachioed, but wearing street clothes. After our chat, I slipped into a packed theater to watch a sneak preview of the first and third episodes of Tacoma FD. That classic Broken Lizard humor was present from the very first scene, where Heffernan and Lemme, in uniform, challenge each other to a saltine cracker eating contest, and then debate the finer points of having a wet mouth. When this little moment pays off as a clever plot device a few scenes later, it became very clear that Tacoma FD was right up there with the best of Lemme and Heffernan’s output. When, in the third episode, the boy’s club is interrupted by the arrival of the chief’s daughter as the newest rookie, the show manages to both embrace and transcend its boy’s club premise, becoming even more wonderfully deranged (and oddly touching). From cranky kids stuck in wells to angry exotic animals, the live crowd at the screening was howling at the antics on screen (much to the relief of Heffernan and Lemme, as this was the very first time they screened the show for the public). Full of good gags, the show also flaunts their penchant for gross-out and toilet humor. “We tried not to be crass,” Lemme explained in our interview. “But,” Heffernan quickly cut in, “it’s just our natural disposition.” To check out all the hot firehouse action for yourself, tune in to Tacoma FD on truTV on Thursday, March 28 at 10:30/9:30c. Giaco Furino is Senior Writer for Studio@Gizmodo. This post is a sponsored collaboration between Tacoma FD and Studio@Gizmodo.